Today is November 2, 2017. 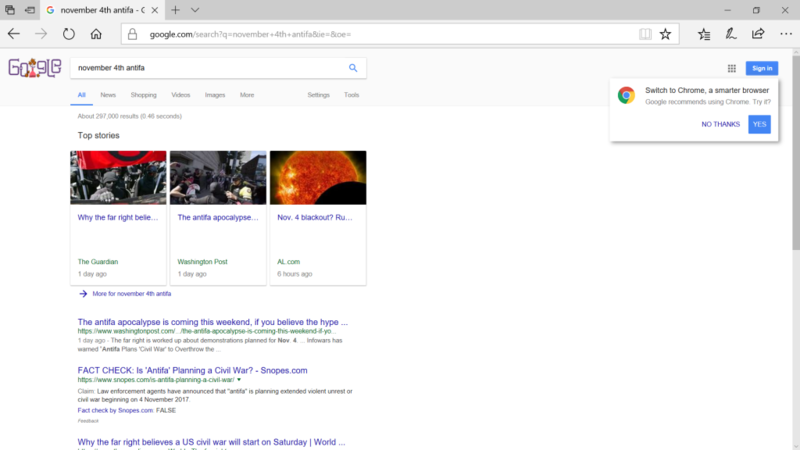 I googled november 4th antifa and Google predictably returned links to the friends of antifa. The first result was from the Washington Post, which has published a full page ad for the RefuseFascism.org, promoting the November 4th riots. The second result was a surprise: Snopes, a fake fact checker, calling FALSE the opinion that “‘Antifa’ is planning a Civil War”. Speaking of full page ads in the Washington Post and New York Times – are they bought with Tom Steyer’s money? A couple weeks ago, a hard Left billionaire Tom Steyer announced a multi-million dollar ad purchase.